Readings: Exo 3:1-8a, 13-15; I Cor 10:1-6, 10-12; Lk 13:1-9. 1/ First Reading: NAB Exodus 3:1 Meanwhile Moses was tending the flock of his father-in-law Jethro, the priest of Midian. Leading the flock across the desert, he came to Horeb, the mountain of God. 2 There an angel of the LORD appeared to him in fire flaming out of a bush. As he looked on, he was surprised to see that the bush, though on fire, was not consumed. 3 So Moses decided, "I must go over to look at this remarkable sight, and see why the bush is not burned." 4 When the LORD saw him coming over to look at it more closely, God called out to him from the bush, "Moses! Moses!" He answered, "Here I am." 5 God said, "Come no nearer! Remove the sandals from your feet, for the place where you stand is holy ground. 6 I am the God of your father," he continued, "the God of Abraham, the God of Isaac, the God of Jacob." Moses hid his face, for he was afraid to look at God. 7 But the LORD said, "I have witnessed the affliction of my people in Egypt and have heard their cry of complaint against their slave drivers, so I know well what they are suffering. 8 Therefore I have come down to rescue them from the hands of the Egyptians and lead them out of that land into a good and spacious land, a land flowing with milk and honey. 13 "But," said Moses to God, "when I go to the Israelites and say to them, 'The God of your fathers has sent me to you,' if they ask me, 'What is his name?' what am I to tell them?" 14 God replied, "I am who am." Then he added, "This is what you shall tell the Israelites: I AM sent me to you." 15 God spoke further to Moses, "Thus shall you say to the Israelites: The LORD, the God of your fathers, the God of Abraham, the God of Isaac, the God of Jacob, has sent me to you. "This is my name forever; this is my title for all generations." 2/ Second Reading: NAB 1 Corinthians 10:1 I do not want you to be unaware, brothers, that our ancestors were all under the cloud and all passed through the sea, 2 and all of them were baptized into Moses in the cloud and in the sea. 3 All ate the same spiritual food, 4 and all drank the same spiritual drink, for they drank from a spiritual rock that followed them, and the rock was the Christ. 5 Yet God was not pleased with most of them, for they were struck down in the desert. 6 These things happened as examples for us, so that we might not desire evil things, as they did. 10 Do not grumble as some of them did, and suffered death by the destroyer. 11 These things happened to them as an example, and they have been written down as a warning to us, upon whom the end of the ages has come. 12 Therefore, whoever thinks he is standing secure should take care not to fall. 3/ Gospel: NAB Luke 13:1 At that time some people who were present there told him about the Galileans whose blood Pilate had mingled with the blood of their sacrifices. 2 He said to them in reply, "Do you think that because these Galileans suffered in this way they were greater sinners than all other Galileans? 3 By no means! But I tell you, if you do not repent, you will all perish as they did! 4 Or those eighteen people who were killed when the tower at Siloam fell on them-- do you think they were more guilty than everyone else who lived in Jerusalem? 5 By no means! But I tell you, if you do not repent, you will all perish as they did!" 6 And he told them this parable: "There once was a person who had a fig tree planted in his orchard, and when he came in search of fruit on it but found none, 7 he said to the gardener, 'For three years now I have come in search of fruit on this fig tree but have found none. (So) cut it down. Why should it exhaust the soil?' 8 He said to him in reply, 'Sir, leave it for this year also, and I shall cultivate the ground around it and fertilize it; 9 it may bear fruit in the future. If not you can cut it down.'" Written by: Fr. Anthony Tien M. Dinh, O.P. I. THEME: Know how to use God’s given opportunities to repent and to bear fruits. No one of us wants to keep useless things because they both take space and can’t be used; for examples, a torn shirt, a shoe which has a hole in it, or an unfolded umbrella, etc. If after we tried to fix and still can’t use it, we will throw it out and buy a new one. Similarly is a human fate before God, He shall use all possible ways to correct and to help people becoming better, such as: to rebuke, to warn and to punish. If after God tried every possible ways and people are still unchanged, He shall take them away to have space and to avoid damages for others. The readings of the third Sunday of Lent emphasize that people must know how to use God’s given opportunities to repent and to continuously improve. In the first reading, God had compassion on the Israelites when they were maltreated as slaves in Egypt. He appeared to Moses from the burning bush and sent him back to Egypt to liberate the Israelites from Egypt and lead them to the promise land of Canaan. In the second reading, Paul wanted the Corinthians to look back to the Exodus event to draw out a concrete lesson for them. Although the Israelites were loved and given opportunity to enter the promise land; but many of them didn’t use the opportunity, but still complained and rebelled, they died before reaching the promise land. In the Gospel, Jesus reminded people to observe what happen around them to draw out important lesson for their life. When they saw people who were died, they shouldn’t think that these people are sinful than them; but to think that death can also happen to them. They must repent and bear good fruits for God. 1.1/ God had compassion and wanted to liberate the Israelites from their slavery. (1) God’s theophany to Moses: He, though is a Jew, but grew up in the Egyptian royal palace as the princess’ son. The reason why he must leave from Egypt to Madian is because Moses killed an Egyptian when this man maltreated a Jew. This new came to Pharaoh and he was looking to seize him. Like the patriach Abraham, Moses never knew God before today event. To let him know God’s great power, He let him see a strange event when he was taking care the flock for his father-in-law’s, Jethro, a Madian priest. Moses was surprised to see that the bush, though on fire, was not consumed. So Moses decided, "I must go over to look at this remarkable sight, and see why the bush is not burned." When the Lord saw him coming over to look at it more closely, God called out to him from the bush, "Moses! Moses!" He answered, "Here I am." God said, "Come no nearer! Remove the sandals from your feet, for the place where you stand is holy ground. 1.2/ God chose Moses to liberate the Israelites from Egypt: When Moses knew that God chose him to lead the Israelites out of Egypt, he foresaw two difficulties in achieving God’s given mission. Firstly, king Pharaoh was looking to kill him at any time, how could he dare to be in his presence and ask him to liberate the Israelites? Secondly, the Israelites shall not believe in him whom they didn’t know and he had no military power in his hand. (1) God revealed His holy names: Moses said to God, “When I go to the Israelites and say to them, 'The God of your fathers has sent me to you,' if they ask me, 'What is his name?' what am I to tell them?” God answered and said Mosed: “"I am who am." Then he added, "This is what you shall tell the Israelites: I AM sent me to you." “I am” means “I am always present.” This is God’s new name which He revealed to people through Moses. In order for Moses and the Israelites not to confuse with a new god, God used twice the sentence, "Thus shall you say to the Israelites: The Lord, the God of your fathers, the God of Abraham, the God of Isaac, the God of Jacob, has sent me to you.” In other words, He is the God whom their forefathers have known and they themselves are asking. 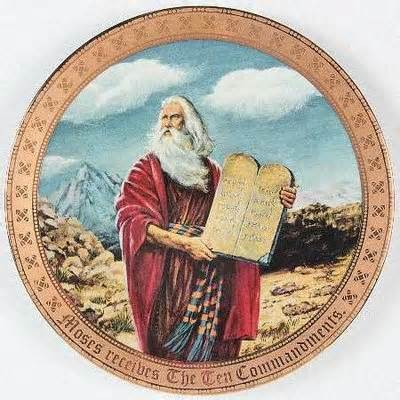 The Jewish tradition later is afraid to use the name “Yahveh” for God, they substitute it by other names, such as: God (Elohim); My God (Adonai); God of Armies (El Sabaoth) or The powerful God (El Shaddai), etc. (2) God’s promise to Moses: To confirm Moses’ faith and to take away his fear, God promised to him, “I shall be with you” (v. 12). This promise began when Moses started his negotiation with Pharaoh, during his forty years wandered in the desert and before the Israelites entered the promise land. Moses must also be tested as the Israelites. His greatest test is though he was seen the promise land from afar; but not to enter it with people. He was died and buried before people crossed the Jordan river. 2.1/ The Exodus event gave important lessons for all the faithful: The background of today passage is Paul’s answer for the Corinthians’ question, “Should they eat meat that has been offered for the idol?” Paul gave them his principle: They can eat it but they must respect those who have a weak faith; moreover, they must be careful of temptations; don’t so overconfident in their knowledge. 2.2/ Learn from past generations: Paul wanted to say that the Exodus event isn’t only about the historical event, but also a lesson for us so that we don’t follow our evil desires as our forefathers. To inherit all God’s priviledges isn’t meant to be entered into the promise land. Like the Israelites in the Exodus event, the faithful are also inherited many priviledges from Christ, such as: to be baptized in his baptism; to eat his flesh and to drink his blood; but these priviledges don’t guarantee that the faithful shall be shared in his glorious resurrection and enter into his kingdom if the faithful don’t know how to use the graces from these sacraments to practice virtues and to overcome all temptations in their life to keep their faith in God. The Corinthians can’t be overconfident with their faith; if they aren’t cautious and build up their faith, they can also fall into temptations as people of the past. 3.1/ All must repent when they still have opportunites. (1) Don’t be so quick to condemn others: The Jewish tradition has a tendency to identify sufferings such as: diseases and death with the individual sins (Job 11:14-15, Jer 18:2, Jn 9:1). In today passage, “some people who were present there told him about the Galileans whose blood Pilate had mingled with the blood of their sacrifices.” Jesus said to them in reply, "Do you think that because these Galileans suffered in this way they were greater sinners than all other Galileans? By no means! But I tell you, if you do not repent, you will all perish as they did!” As Jesus’ answer in John 9:1, he refused to make a connection between sufferings and sins. (2) Learn from the past generations: What Jesus wanted to emphasize is that people must know how to draw out lessons for themselves when they witness sufferings which happened for others. In two examples in today passage, Jesus wanted to emphasize the need to repent when there is still opportunity; if people don’t repent, they shall also die without inheriting the salvation. (1) Human beings must bear fruits for God through good deeds: The tree that bears no fruit is an useless tree; the human being who bears no fruit for God and others is also an useless person. When a person and a thing are useless, they shall be thrown out to provive space for others; when they are thrown out, they shall be destroyed. The fact that the owner patiently waited for three years before he commanded it to be cut down showed his patience. God acts the same, He gave people many opporturnites to correct themselves and to bear fruits for Him. People must be prudent because they don’t know when is the last opportunity. They can't assume that opportunities shall keep coming. Many people whom we saw last year, we no longer see them this year. This can also happen to us; therefore, live this Lent as our last one and use God’s given opporturnity to repent and to return to Him. - God let us live in the world to work for our own and other’s salvation. - If after God gave us so many opportunties to receive salvation and we still deny it, He must take us away so that we shouldn’t damage others’ soul. - Let us take an opporturnity as the last one because we don’t know if other opportunity shall come. Moreover, why we don’t take an opporturnity to live happily and in peace as soon as possible so that we are no longer the slaves for our own flesh, the world and the devil?